Beginning Wednesday morning, October 14, 1987 and for the next couple of days, the nation was riveted to TV screens as we watched the rescue of “Baby Jessica.” Jessica McClure, then 18 months old had fallen 22 feet into an 8-inch wide open well at her family’s home. Rescuers worked 58 hours to get down to where Jessica and get her out. The man who finally made it down the 30-inch parallel shaft was double-jointed in his shoulders, which allowed him to squeeze into the tight space and make the rescue possible. The rescue definitely took a lot of people, but it was that man who reached down himself to get her and bring her back up. Scripture says that each of us like sheep have gone astray from God (Isaiah 53:6)… from His love… from His will… from His plans… from His protection. It also says that all of us have fallen short of His glorious standard (Romans 3:23)… His standard of perfection… His standard of love… His standard of good. We’re like the old medical alert device commercial talking about falling and not being able to get back up on our own. We are, in a sense, like Baby Jessica… fallen and trapped. But in our distress, we cry out to God for help. 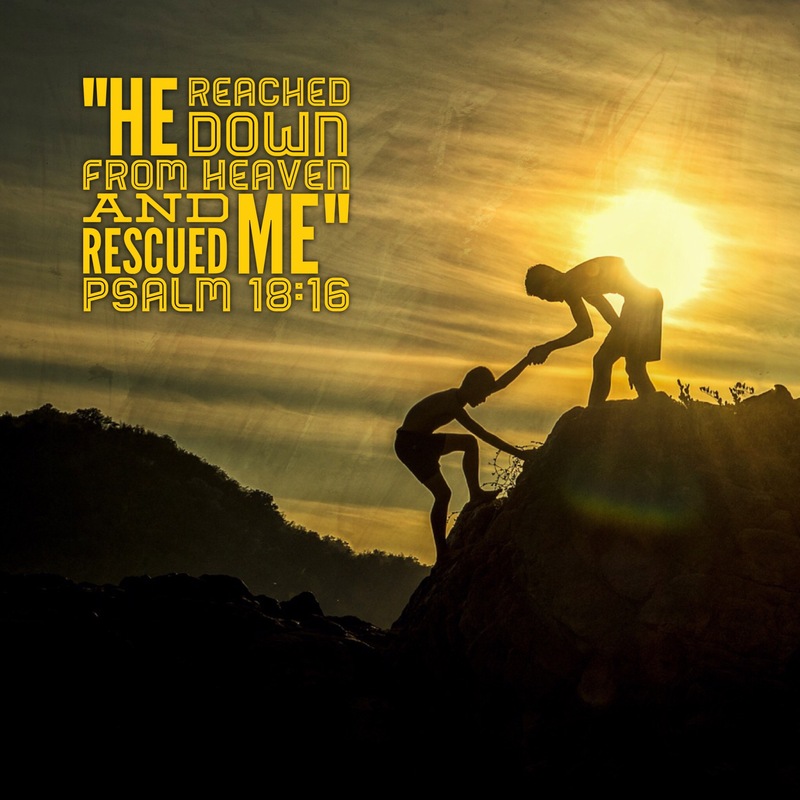 And when He hears, He rushes… He responds… and He reaches out to rescue us. He doesn’t just call out instructions to us as to how to get out on our own. He doesn’t tell us why we are bad for having fallen. He doesn’t tell us that it’s our fault we fell. He doesn’t talk about how much it’s going to take to get us out. He doesn’t talk about how dirty He would have to get in order to get us out. He just reaches… reaches out His clean hand to grab hold of our dirty hand. He reaches… reaches out His strong hand to grab hold of our weak hand. He reaches. There is something about an outstretched hand from above when you’ve fallen. It says, “I want to help.” It says, “I care.” It says, “You don’t have to stay there.” It’s an open hand. It’s a vulnerable hand. And when we cry out to God in the moments of distress in our lives, He flies to our rescue, reassuring us with His words… and extending a loving hand in our direction to know that help has arrived. By the way, He reaches out to us regardless of our situation. Whether we fell because of our own choices, or because we were pushed. He reaches out when we are distressed by our sin, but also in times of financial distress… relational distress… emotional distress… physical distress. Regardless of your distress, God reaches your direction. So, when you see that strong, loving, capable Hand of your Creator reaching down in your direction… reach up and grab it. He’ll do the rest… as we will discuss tomorrow. Wow Pastor amazing word ..I was reading it the presence of God over took me tears as I could almost visibly see Him reaching out for me. Thank you for your obedience to God for sharing. It brighten my day!